If you would like Nylund’s to help arrange car rental while we repair your vehicle, it would be our pleasure to do so. If you have questions about whether your insurance policy covers rental reimbursement, we encourage you to review your policy or contact your agent. It is important to know the limits and terms of any such coverage so as to establish proper expectations while we are working on repairing your vehicle. Rental reimbursement (or rental car coverage) is a type of optional car insurance coverage that helps pay for the cost of a rental car while your vehicle is being repaired after a car accident or after suffering damages that are covered through your car insurance policy. This coverage is not required as part of your car insurance policy, but is beneficial if you do not have a secondary vehicle and need to travel to work or school while your car is undergoing auto repair. 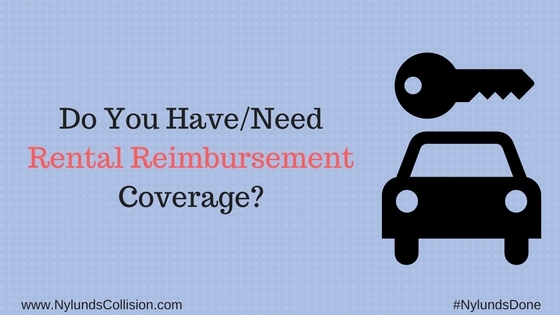 If you believe that you were never offered rental reimbursement coverage and feel that you should have been, you may wish to explore an errors and omissions case with your insurance company.